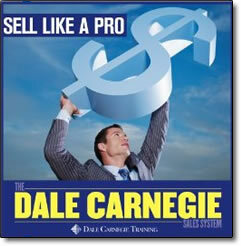 Sell Like a Pro by Dale Carnegie – Discount! More than ever before, people today are more protective of their time and their money. And they’ve mastered how to dodge salespeople, resist standard sales techniques, and essentially CONTROL the sales process from start to finish. The second you abandon the typical sales formula . . . that’s when you start partnering WITH your prospects and customers. And that’s when you start to become a high-commissioned sales professional! In the tradition of Dale Carnegie’s legendary book How to Win Friends and Influence People, Sell Like a Pro teaches you how to truly read and connect with your prospects. Unlike any other sales solution, Sell Like a Pro interweaves the proven conversation techniques, power of persuasion tips, and success principles of Dale Carnegie Training into every session. How to get a response—and RESULT—from every email you send. To easily slip past gate keepers and dodge voicemail to maximize your calling—and closing—efficiency. To s tart asking the 7 critical qualifying questions only top producers regularly use. How to anticipate, identify, and quickly overcome objections in 3 quick steps. To set up an automated referral-generating system that continuously provides leads. Sell Like a Pro is the true foundation of successful selling. It’s worked for many years, through many recessions—and as the sales profession has become more customized, it’s not truer than ever before.